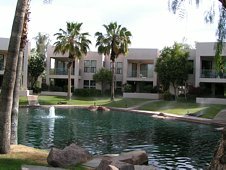 Just an easy stroll to the Estate Club, these lovely one and two level condominiums are tucked away in the northeast corner of Gainey Ranch. Floor plans vary, as do views – either golf course or lagoon. Sizes from 1100 to 2243 square feet. HOA fees are $506 monthly, and this includes your water bill! Prices from the $350,000 area.